The higher up on the chart a player is the tougher the opposition is that he is facing and the further to the right a player is the more defensive zone draws the players takes. That means that the upper right corner of the chart is where players who are trusted most by their coach and get the least protection are found. The color of the players bubble is determined by their relative corsi to the rest of their team. The deeper the blue in the bubble the better the players Corsi is and the deeper the red the lower the players Corsi is. I chose rel corsi because I believe its a better indicator for the individual player regardless of how good of a possession team they play on. Lastly the size of the bubble is determined by the time on ice the players plays, the larger bubble indicates more minutes. 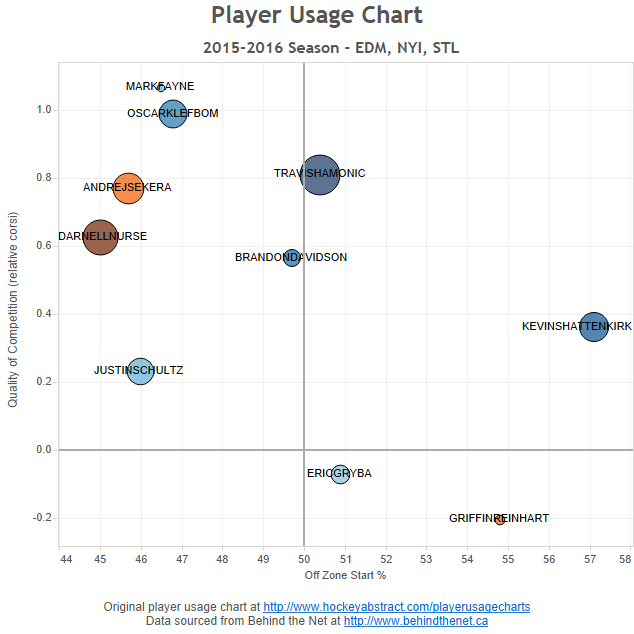 Its pretty clear to me looking at this chart that Hamonic is a top pairing d-man and Shattenkirk is a second pairing. Hamonic is starting more shifts in the defensive zone and doing it against tougher competition than Shatenkirk and still has a bit better relative corsi. He also plays substantially more minutes than any body else on this chart. Shattenkirk is playing 2nd pairing minutes, getting the offensive zone push and playing easier competition than Hamonic and really isn’t the proven top pairing defenseman the Oilers need. Personally, I’d love to get both of these guys but if I had to choose one it would hands down be Travis Hamonic. The Edmonton fans have suffered a long time, thanks to poor management decisions (replacing Krueger with Eakins! ), and year after year of ridiculous injury issues (365 plus man games lost this year, often including their top D-man and two or more of their top six forwards) they and the team- absolutely deserve a better roster. They finally made some meaningful management changes, and I think the case can be made that with fewer key long term injuries, this campaign’s Oiler team would have made some real strides forward, and perhaps even contended for a playoff spot. For the fans… it’s been like a nightmare that you THINK you’ve awakened from only to find it going on and on and on. Feel that pain, and have a bit of sympathy- not for the owner, or his management team, but for the fans who have long deserved better. Who cares?! The Oilers don’t deserve a team. No first overall pick wants to go where #1’s go to die. When is the NHL going to fire the Oilers from the NHL? Gretzky’s not out there anymore Edmonton so stop trying to get him first overall again.